For quite some time, I used to carry the camera in an unzipped LowePro AW Rezo 140 (discontinued) camera bag. It solved the problem of fidgety handling, but my neck still complained. 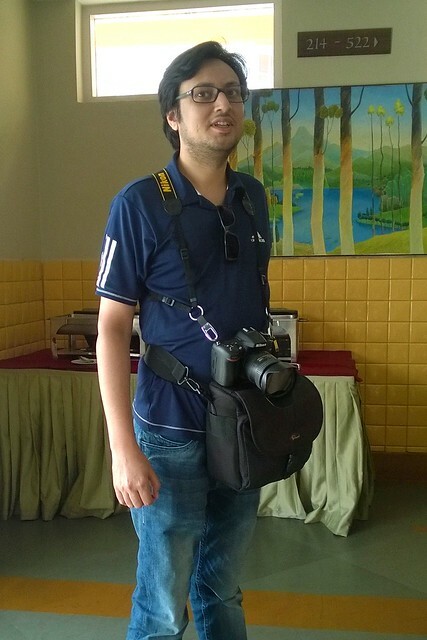 The shoulder harness is carrying a D7100 + 16-85mm VR while the waist pack is carrying a D90 + 55-300mm VR, an RX100, my wallet and hotel keys and small accessories. I really loved the shoulder harness and it performed well on walking and biking excursions but it’s only suitable for a small body with a short lens because the lens sticks out in the front. The waist pack was very useful but a bit restricting in mobility and a bit too ungainly. 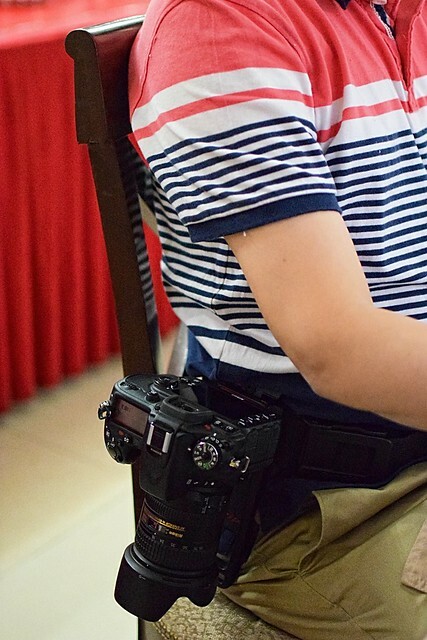 Sturdy System: The designers of b-grip have paid a lot of attention to small details that make sure your camera gets a sturdy and stable seat when nestled in the holster. The quick-release plate has a unique screw lock that prevents the plate from coming loose in repeated use – one of the best solutions I’ve found for essentially the biggest risk in various carrying solutions. WDS Works: b-grip features a contoured holding plate that incorporates what the makers call the Weight Distribution System (WDS). This system actually works and is not just marketing jargon. Without WDS design, there would be a lot of torque exerted on the belt by the camera and it would tend to make the belt dig into the waist while making the camera bang against the legs. No such worries with WDS. The camera sits rigid. 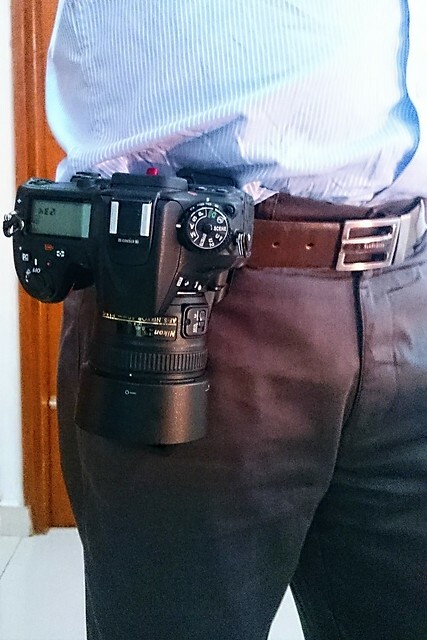 Low Fatigue: I had the holster on for 8 hours, with a D7100 and 16-85mm VR clipped on and I didn’t feel any fatigue. The broad nylon tactical belt that it ships with actually helped in reducing lower-back fatigue by virtue of being tightly wrapped around the waist. Ever since getting rid of the neck strap, I used to walk with the camera in hand to avoid fiddling with camera bags. The b-grip was so quick and convenient that I simply clipped the camera on as soon as I was done clicking, even if I had to take it off again just half a minute later. No more wrist strain from holding the camera while walking! Flip-Out Stand in QR Plate: This might seem like a frivolous detail, but is actually very helpful in the field. 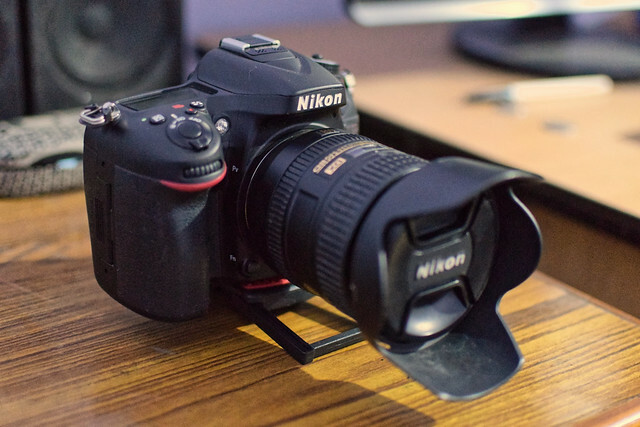 The b-grip quick-release plate comes with a flip-out stand that allows putting the camera down on a table-top, etc. without causing the camera to topple forward under the lens’s weight. Stress on Tripod Screw: Essentially, the weakest point in the b-grip and most other systems in my mind is the tripod screw of the camera itself. I fear a lot for its threads getting sheared due to stress because it’s not designed for hanging the camera by. I would consider having a tether running to the shoulder to prevent a disaster in case the tripod screw fails. It took me a lot of painstaking research to come up with the DIY twin-strap harness that didn’t hook into the tripod screw for this reason. Sitting is Hard: With the b-grip strapped on, the harness plate must be moved to the side to be able to bend ones legs enough to sit. In the slightly cramped backseat of a car, I had to sit with the camera in my hands and yet the b-grip dug into my sides. In a more spacious setting, though, it wasn’t much trouble setting the camera aside and sitting down. No Stowing Solution: Closely linked with the above, I missed a camera bag when I had to sit for extended periods and wanted the camera to be securely stowed away. Based on the experience in the field, I would highly recommend b-grip Belt Harness as a carrying solution. I’ve researched several belt harnesses and though I haven’t tried them all, I doubt that any of them would exceed b-grip in security and convenience. Before you go out and buy it, however, you must ascertain for yourself that a belt harness is what you want. Shoulder harnesses are almost as comfortable and the nature of these solutions is different enough that some people might prefer a shoulder harnesses over a belt harness. Whatever you do, though, get rid of that neck strap right away!